The Jetforce Avalanche Airbag system is a state-of-the-art technology that inflates your Airbag electronically, meaning you can store more than a single use and use it repeatedly by simply re-inserting the deflated airbag into your pack. Avalanche Airbags work due to the Inverse Segregation or “Brazil Nut” Theory; which in short refers to how the largest object in a moving pile will most likely shuffle to the surface. Once you are at the surface and the avalanche has stopped you will be much easier to rescue. If you don’t rise to the surface the Airbag will deflate and leave you with a large air pocket under the snow ready for rescue. Scroll down the bottom of the page for the FAQ. 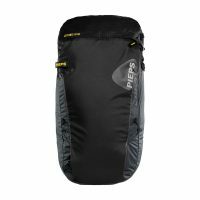 What is the difference between the Pieps and Black Diamond Jetforce packs? 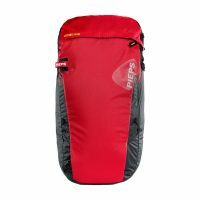 The most notable difference between the Pieps and Black Diamond packs (other than the aesthetic) is the compression straps going over the surface of the pack. These are fitted with Pieps branded non-icing buckles and help keep the pack's form while the user is wearing it. When you see an avalanche approaching, the user pulls firmly on the deployment handle which fills the 170-litre airbag, the airbag inflates in 3.5 seconds (faster than a cylinder system) and surrounds the pack in an upside down U formation. This aids buoyancy and makes it unlikely that the user will become buried under snow. When you press the activation button, a powerful battery powered fan starts pulling in air from the atmosphere to fill the bag. Once inflated, the fan goes through a regular reinflation cycle for 3 minutes ensuring that the bag stays inflated even if it has any tears. What speed is the fan? Through Black Diamonds experience with the AvaLung, they have done years of research to prove that the snowpack maintains large amounts of available air. They have designed the system to draw in air from many locations around the pack, thereby reducing the concern if any one of these spaces could be fully blocked. The Jetforce fan runs about 3 times longer than needed to actually fill the bag, thereby allowing for the reduced efficiency when fully buried. Can the system be interrupted during deployment? Yes, by holding the power button for 4 seconds after the mandatory initial inflation phase, the user can stop the Airbag inflation. The second is the entire back panel of the pack, it is made from open cell reticulated foam that acts as both a filter and air intake. The third is through the mesh lining of the airbag pocket itself after the airbag has been activated. Having three intake locations allows the system to rapidly gain a large volume of air despite any impediments like snow, clothing, or equipment. The system cycles through multiple phases throughout the deployment. Each phase is specifically tuned to optimize safety and battery life. 0 - 9 seconds - Mandatory Fill: During the first 3.5 seconds, the airbag fills 100%. For the next 5.5 seconds, the system continues to run at full speed for safety redundancy. 10 - 60 seconds - Active Performance: The system pulses between full speed and 50% speed. Since this is the most likely time to be carried by the avalanche, it is most critical to maintain full volume and recover from any possible tears. 61 - 180 seconds - Volume Maintenance: The system has 20s stand-by intervals between 3s full speed refilling pulses. The goal is to maintain the volume to aid in visibility and meet CE timing requirements. Why does the airbag deflate? While most airbags only work well in an active avalanche, the Jetforce offers increased safety for a user caught in a terrain trap or if the slide came down from above. When the airbag deflates during a complete burial scenario, it will create a large air pocket around the user. How do I put the airbags back into the pack after activation? The Jetforce Airbags simply need to be stuffed back into the bag after deflating. No folding or rolling necessary. This can be done in minutes. The airbags are made from 315 Cordura material. Cordura is the world’s leading manufacturer in durable fabrics. Used by retailers, brands and even the military; Cordura 315 uses high tenacity filament nylons to not only be lightweight but also very resistant to tearing and abrasion. How many deployments do I get from a single charge? The Jetforce airbags batteries can hold 4-6 deployments on a single charge, this means you can have as many practice attempts as you like without any additional cost. This also means if you forget to charge your pack overnight after deployment you will still have other deployments ready on the battery. What type of battery is used? Does the temperature affect the battery? The Jetforce battery is a Lithium Ion; the same as most laptop computers. The battery has been specifically engineered to continue operating at extreme cold temperatures (-30C). A completely depleted battery will need 8 hours of charging to reach full charge. A with all Lithium batteries, we recommend the battery is maintained close to a full charge. 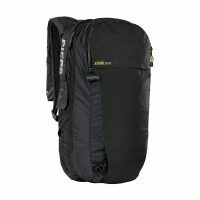 Is the Jetforce Airbag interchangeable between packs? 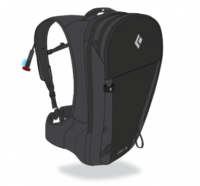 The Jetforce mechanism is built into the backpack and not interchangeable. The ABS airbag style provides this functionality. To maximize the effects of Inverse Segregation (see above). Increased Impact Protection: A larger area of the balloon around your head and torso help to prevent impact. Maintaining Effective Volume: By starting with a larger volume, it is easier to maintain an effective volume despite punctures or tears. What effect does the Jetforce Airbag have on transceivers? The Jetforce has a very minimal effect on transceivers when the fan is running and you are within very short range, you may experience some interference. Why don’t the Jetforce bags incorporate the AvaLung? The Avalung is a great technology that could benefit airbag users, however, the additional technology might be confusing to novice users as both rely on the shoulder straps. You can purchase an AvaLung Sling if you would like to do both which can be used with any pack. The airbags automatic deflation has the potential to create the same volume of breathable air as the AvaLung. What’s the status of Jetforce field testing? The Jetforce airbag has been lab and field tested for the last 3 years. Like all Black Diamond and Pieps products, the packs have been rigorously tested before being released to the public. What are the airline rules when taking them abroad? While Airline staff and security have the final say with what you can take on board their plane, the Jetforce bags are considered consumer electronics devices (as they contain no gas canisters, explosives or triggers) therefore they are fine for both the luggage hold and hand luggage (where limits permit). Black Diamonds official statement regarding air travel can be found here.